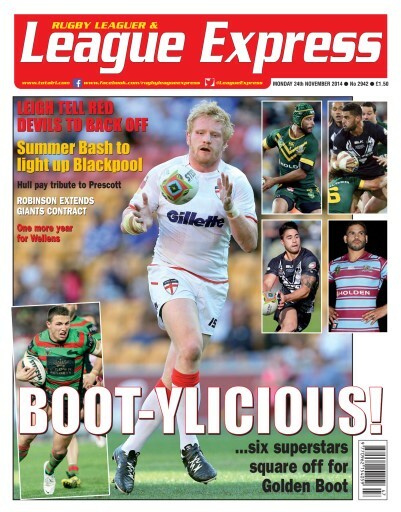 In this issue of League Express we have all the latest news, analysis and gossip from Rugby League, including all the news from Super League, the Championship, League One and the amateur game, as well as Rugby League in France,other parts of Europe and down under in Australia and New Zealand. We have columns from editor Martyn Sadler, Hall of Fame member Garry Schofield, Championship correspondent Gareth Walker, amateur editor Phil Hodgson and our Australian correspondent Malcolm Andrews. In our series on the RFL Hall of Fame, this week we turn the spotlight on Barrow hero Willie Horne. Our front page has the six players who have been shortlisted for this year's Rugby League World Golden Boot. And we have a special feature on the Super League players who have announced their retirement at the end of the 2014 season. We preview Hull FC's 2014 season, as well as the 2014 season for Halifax and Barrow Raiders. And we give you the chance to win replica shirts from Hull FC and Hull Kingston Rovers.